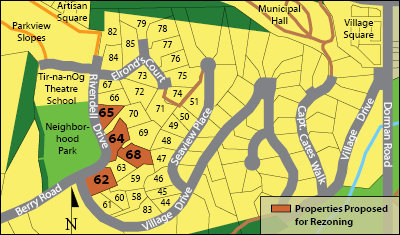 In November 2014 Cates Hill Joint Venture applied to Bowen Island Municipality to allow stratification of one building on each of Lots 62, 64, 65, and 68 on Rivendell Drive on Cates Hill. The four buildings shall be built exactly as already allowed under the current zoning, namely as single-family detached homes including legal secondary suites — the same as other homes in the immediate neighbourhood and elsewhere on the island. The only difference will be that the secondary suite can be separately owned by a “secondary owner” instead of rented by a tenant. In other words, instead of the building being occupied by one party as owner and the other party as renter, the ownership of the building will rest with two owners. All other regulations shall remain exactly the same as already allowed — i.e., the overall building size, the size of the suite relative to the main part of the building, lot coverage, setbacks, height restrictions, parking requirements, etc. The proposed rezoning shall not allow subdivision or bare land stratification (i.e., the subdivision of the land into two bare land strata lots). Therefore, the proposed rezoning will not increase the already allowed density (i.e., the number of residents per lot). It will not increase parking. It will not change the form and character of the neighbourhood. It will not cause increased demand on public services. What is the intent for the rezoning? We want to continue what has already been done successfully on several of the adjacent lots on Rivendell Drive and elsewhere on Cates Hill, namely the construction of one building per lot that contains two dwelling units — typically one unit for the owner, and a second unit (secondary suite) for a family member or tenant. This building form is typically called a “mortgage helper.” In the past, mortgage helpers have enabled many young families to build or buy a house which they could not have afforded otherwise, and they have provided an otherwise rare source of legal rental accommodation on the island. However, due to increased costs since 2007/2008, the costs to construct secondary suites are higher than what lenders are typically willing to finance. As a result, the so-called “mortgage helpers” of the past regrettably don’t seem to work any longer on Bowen island. The proposed rezoning shall serve as a “pilot project” to explore public opinion about housing diversity and affordability. While the need for such is widely recognized and prominently stated in three successive Official Community Plans, it has become urgent to put policies and bylaws into place to allow for the construction of diverse housing forms. Current Zoning. Lot 62, 64, 65, and 68 are in Area 1 of the Comprehensive Development CD2 Zone for Cates Hill, which permits one detached dwelling per lot, secondary suite, uses accessory to principal use, and home occupation use. The regulations for secondary suites in Section 3.54 of Land Use Bylaw No. 57, 2002 contain the following restriction in Section 3.54.7: “That the creation of a strata lot pursuant to the Strata Property Act for a secondary suite shall not be permitted.” Our application requests that this restriction not apply to Lots 62, 64, 65, and 68, thereby allowing stratification of the building on each of those lots to create separate title to the suite. We want to point out that the proposed buildings with suites each will have the same footprints; the same Floor Space Ratio; the same form, character, and size; the same number of parking units; and the same impact on the neighbourhood and services as currently permitted under the existing zoning (i.e., a single-family dwelling with a secondary suite). Designs are still being finalized. Here is the concept of the house+suite on Lot 64.